Andrea Ayres-Deets is the Lead Writer at ooomf, an invite-only network connecting short-term software projects with handpicked developers and designers. Andrea writes about psychology, creativity, and business over on the ooomf blog. That’s an unnaturally short period of time. I knew it, my boss knew it—yet here we were—both agreeing to this farce. Two hours later I had produced not an article, but random words thrown into a document with some pictures. Meanwhile, I’d anxiously await his inevitable response: Are these even words? Rewrite. My life was punctuated with moments like these, horrible and painfully unnecessary moments because I was a habitual over-promiser. Under-promise and over-deliver. A phrase often spoken but rarely explained. Who wants to under promise? That sounds terrible. Shouldn’t we just over promise and do what we can—it’s the effort that counts, right? Promises date back thousands of years, they represent a complex social norm and when we break them, the consequences extend beyond our control. Here’s why you should always under-promise and over-deliver. Before courts, laws, and complex social systems, we had promises—the assurance that something will be done. Promises are still one of the most important tools we have to help us navigate social encounters. 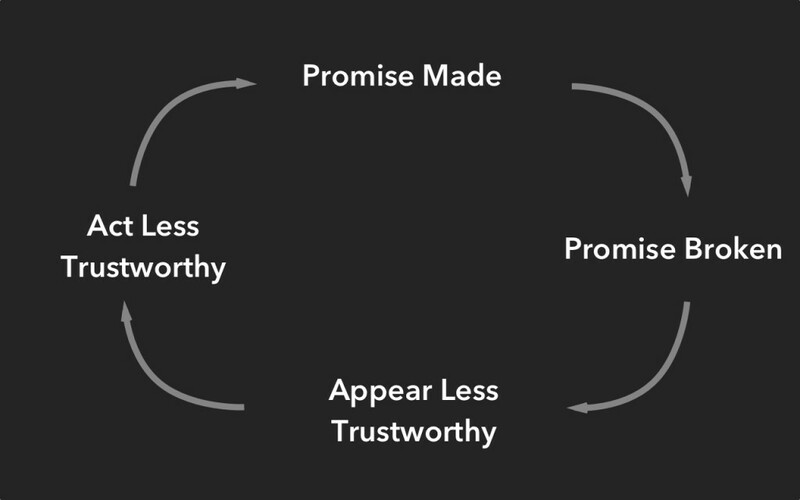 People keep promises because it helps to build the foundation necessary for maintaining and evolving relationships. The larger the promise, the greater the obligation is to fulfill it. Big promises create big expectations and when those expectations aren’t met the brain responds by signaling a decrease in dopamine production. When we make a promise and meet or exceed expectations that signals an increase in dopamine production which makes us, and the person(s) we made the promise to, feel good. 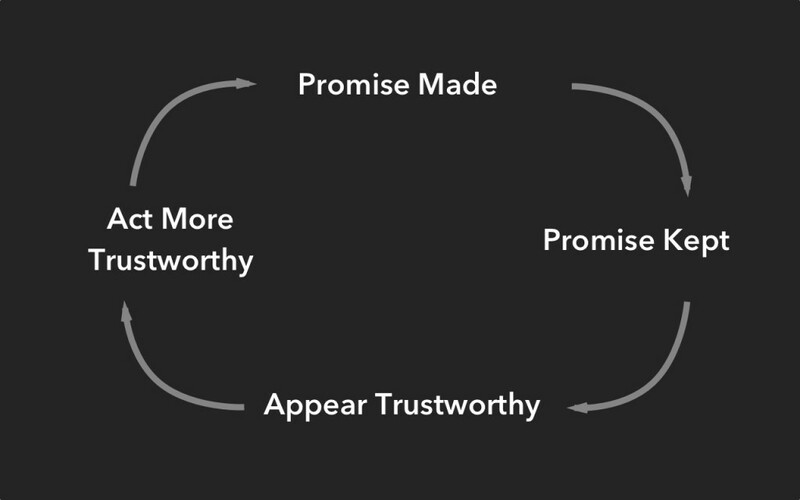 Promises also help signal to the outside world our level of trustworthiness. A study by Dutch Researcher Manuela Vieth, found that broken promises cause us to want to punish and seek revenge upon the promise breaker. These feelings impact any future interactions between the two parties involved. Your brain knows when you are going to break a promise long before you are even willing to admit it to yourself. 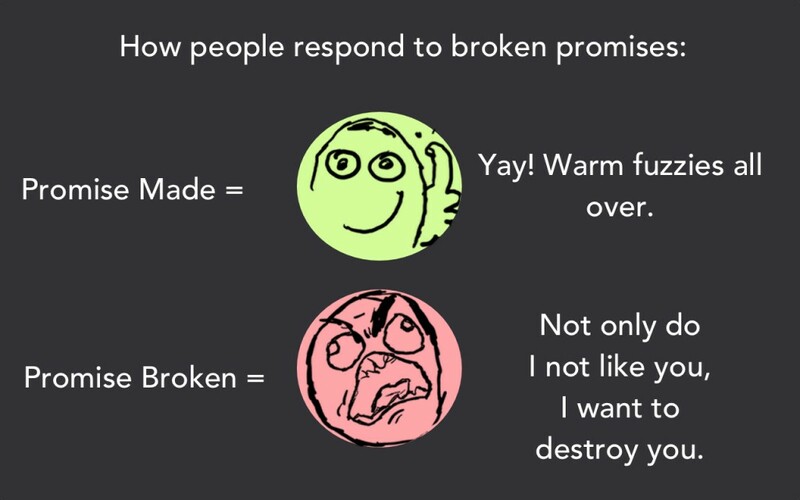 Researchers in Switzerland discovered that they could predict who would break a promise based on the brain’s reaction during the three-stage model of promise making. Let’s say you’ve told your coworkers that you would absolutely, definitely, help them finish a project. At this initial stage, you haven’t fully decided whether or not you are going to keep or break the promise to your coworkers. Your brain, however, has already registered an emotional conflict because it knows that you don’t really intend on keeping that promise. Because of this, the brain will activate your negative emotional processing centers. The anticipation of their response causes you increased stress, which of course your brain will register. Your brain is already preparing you for possible negative outcomes and future consequences. You’ve decided to break your promise to your coworkers because you are too busy. The decision to break a promise promotes a reaction in your brain similar to that of a lie or deception. You’ll feel some guilt and fear over how breaking this promise will affect you. To combat these feelings your brain will remind you of the motivation for breaking the promise by activating your reward-based decision making part of the brain. You should make a promise out of your genuine desire to follow through, not because you feel an obligation to do so. Consider what you are trying to achieve by making this promise and whether or not it can be obtained by making a smaller, more manageable promise. Example: It’s Wednesday and you are not even close to half-way done with a project, but you promise to have it completed by the end of the week. You make the promise because you want to impress your co-workers, but you’ve forgotten to take into consideration all of the other work you have to do. Instead of promising to complete the entire project in an unreasonable amount of time, break the project up into sections. Promise to have portions of the project completed by a certain date. This allows you to manage expectations and keep up with the workload. You’re co-workers will still be impressed and you’ll be able to keep your promise. Double points! Estimate how long you think it will take you to fulfill the promise and then double or triple that time. If you are not able to answer how long it will take you to complete a task, don’t give an answer. Tell the other person or group that you will get back to them. Example: If an article normally takes me three days to write, I’ll say four just so I have extra time in case part of the process takes longer than planned. 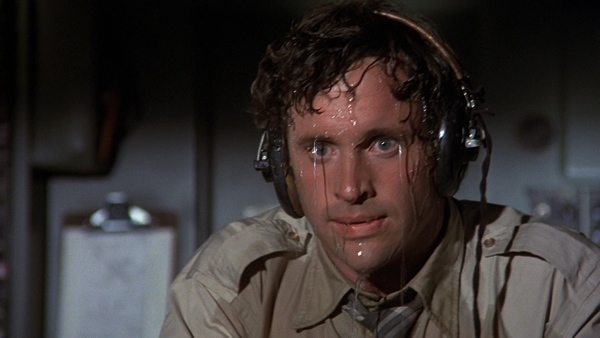 If I get it done before the four day period is up, that makes the client happier, it makes me happier. Everyone wins. Sometimes we can’t help but break a promise. Be up-front and immediately offer an apology. It makes a difference and will go a long way towards repairing your relationship. I offer the reason—not an excuse—and a solution for how best to avoid this situation from happening the future. When I under promise I’m able to surprise not only those around me but often myself. It gives me the space to do my absolute best and that makes me feel good—that makes me feel proud. This is about giving yourself momentum. Each time you make good on a promise you will feel that much more confident in your abilities. Every promise fulfilled will help you to associate your name with positivity and trust. 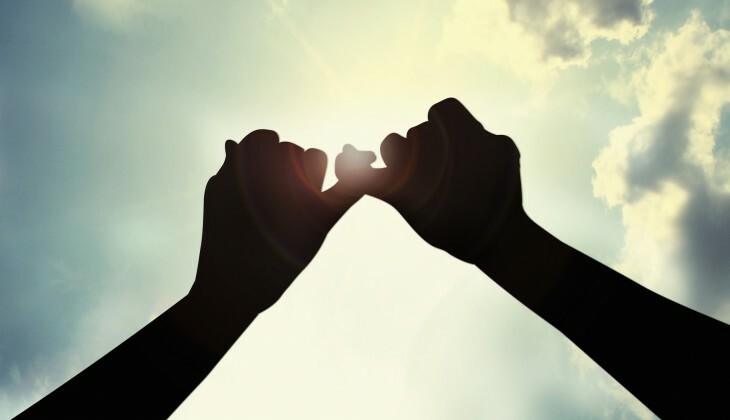 Making promises you can keep is instrumental to helping you build and maintain any relationship in life.